Put that leftover cauliflower rice to good use with these incredibly moreish Ricotta and Cauliflower Tater Tots. Just a handful of ingredients and a little bit of time will give you a snack that is perfect as a side on your dinner table, as a walking appetizer or tucked away into a little one’s lunch box. I was once again victim to the convenience factor of the Costco sized bags of riced cauliflower. The price on that stuff just cannot be beaten, and during a busy week, it is so handy to just reach into the fridge for some pre-riced veggies. Lazy I know, but sometimes the convenience factor just wins. If you do want to make your own cauliflower rice, then check out this post and sub in cauliflower for the broccoli. How Do I Use Cauliflower Rice? After using some in my Vietnamese Pork Bowls, and more in my Cauliflower Burgers I was left with a weird amount of cauliflower that needed to be used or frozen for another date. That’s when these little-riced cauliflower babies were born. 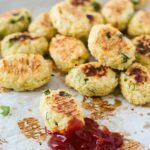 With just a handful of ingredients you have these little ricotta and cauliflower tater tots that are surprisingly loaded with flavor, and a HUGE hit with the kids (especially if there is some ‘red sauce’ for dipping). Use them in place of wherever you would normally serve some tater tots. My kids love them in their lunch boxes as well, so they make a great little grab-n-go addition to the snacks in the fridge. How do you eat your Ricotta and Cauliflower Tater Tots? I love hearing from you so be sure to leave a comment if you try them out. Happy eating. Put that leftover cauliflower rice to good use with these incredibly moreish Ricotta and Cauliflower Tater Tots. Just a handful of ingredients and a little bit of time will give you a snack that is perfect as a side on your dinner table or tucked away into a little ones lunch box. Line a baking sheet with parchment paper and spray with non stick oil. What delicious little bites! I had no idea you can do that to cauliflower! DO I have to share or can I eat the all by myself? These sound so good that I think I could even get my picky eaters to gobble them up in a hurry! These look amazing. And since they are the same shape as frozen store bought tater tots I’m sure they will fool my kids! You had me at ricotta, this recipe is speaking my language!! I could eat all 24 in a sitting! YUM!